An Achilles tendon rupture, or tear, is a common condition. This typically occurs in the unconditioned individual who sustains the rupture while playing sports, or perhaps, from tripping. There is a vigorous contraction of the muscle and the tendon tears. As with any muscle or tendon in the body, the Achilles tendon can be torn if there is a high force or stress on it. This can happen with activities which involve a forceful push off with the foot, for example, in football, running, basketball, diving, and tennis. 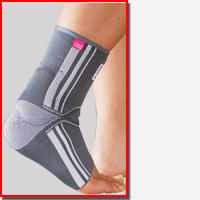 The push off movement uses a strong contraction of the calf muscles which can stress the Achilles tendon too much. The Achilles tendon can also be damaged by injuries such as falls, if the foot is suddenly forced into an upward-pointing position, this movement stretches the tendon. Another possible injury is a deep cut at the back of the ankle, which might go into the tendon. Sometimes the Achilles tendon is weak, making it more prone to rupture. Factors that weaken the Achilles tendon are as follows. Corticosteroid medication (such as prednisolone) - mainly if it is used as long-term treatment rather than a short course. Corticosteroid injection near the Achilles tendon. Certain rare medical conditions, such as Cushing's syndrome, where the body makes too much of its own corticosteroid hormones. Increasing age. Tendonitis (inflammation) of the Achilles tendon. Other medical conditions which can make the tendon more prone to rupture; for example, rheumatoid arthritis, gout and systemic lupus erythematosus (SLE), lupus. Certain antibiotic medicines may slightly increase the risk of having an Achilles tendon rupture. These are the quinolone antibiotics such as ciprofloxacin and ofloxacin. The risk of having an Achilles tendon rupture with these antibiotics is actually very low, and mainly applies if you are also taking corticosteroid medication or are over the age of about 60. Patients present with acute posterior ankle/heel pain and may give a history of ?felt like someone kicked me from behind?. Patients may report a direct injury, or report the pain started with jumping or landing on a dorsiflexed foot. It is important to elicit in the history any recent steroid or flouroqunolone usage including local steroid injections, and also any history of endocrine disorders or systemic inflammatory conditions. During the clinical examination, the patient will have significantly reduced ankle plantar flexion strength on the involved side. When the tendon is palpated with one finger on either side, the tendon can be followed from the calcaneus to where it "disappears" in the area of the rupture and to where it then returns 2 to 3 cm proximal to the rupture. If the injury is recent, the patient indicates that her pain is localized at the site of the rupture. The defect eventually fills with blood and edema and the skin over the area becomes ecchymotic.